I am still hanging out…waiting on the stitches in my hand to be taken OUT in another week! Things have been quiet on my blog because I haven’t been doing too much. (Stitches are from surgery, not rotary cutter injury!!!) Anyway, I am healing and puttering about trying to find ways to entertain myself and not get totally bored. Two days post surgery I had a morning gathering of quilters come work with me on “Second Time Around” fabrics. I was pretty useless, so I did things like pretend to iron, and organize, teach and answer questions. My helpers were great. The next day I was able to remove the surgical bandages and wash my hair~!~ (If you have been restricted you must know how great that was!) There is really nothing worse than trying to shower with you hand in a plastic bag all taped up! I am now using small bandages which I can change myself and do so everytime I wash my hands. By the time the next round of helpers came on Monday to work with the “Second Time Around”, I was in much better shape and able to do the ironing with no difficulty. We got a lot of fabric worked in the last week, setting some aside for the April Ocean Waves Quilt Guild Show. I have a big booth to fill with fabric at the show for the guild, and there are going to be some beautiful pieces for sale! One of my faithful helpers, Joyce, worked at home folding and sorting and arranging fat quarters. I picked those up from her on Friday morning and I have to say, the arrangement is beautiful. I think there were at least 75-100 that she folded in cute little triangles. I am setting those all aside for the quilt show, along with those fantastic patriotic ones I got from another friend on Thursday! It’s hard to not put these all out at the OWQG meetings and to save them for the show, but I want to have the very BEST items at the show!! I’ve been sorting through donated buttons too, bagging the sets up to prepare to sell. My dilemma with buttons is how to make all the work of sorting and bagging pay off. Buttons are a funny thing. We all buy them, we save them in metal tins, and cute jars or funny boxes. We dig through the box looking for “just the right one”, and when we can’t find it, we go to the store, pay $2-12 for the PERFECT button, use one on the card and throw the rest in the button tin! 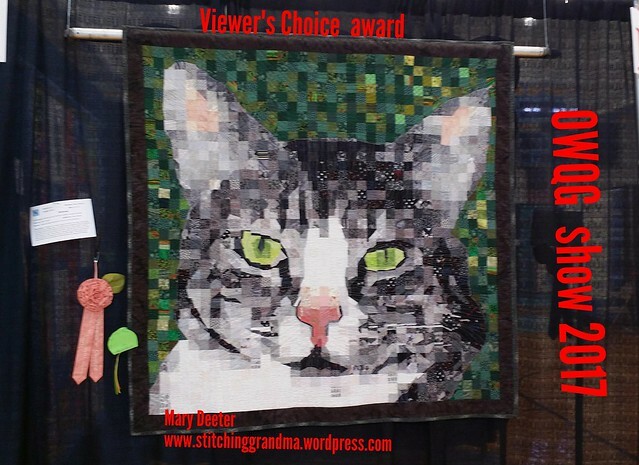 I’m looking for creative ways to “market” those buttons at the guild meeting and the quilt show. One of my daughters suggested some “button craft ideas” might help, so I started a Pinterest Button Fun page to gather ideas. I rode on Wednesday night in the Lifecycle Community Slow Cruise with 25 or so folks. Headlights, tail lights, bright clothing are in order when you ride just after the sun sets. I added a light to the back of my bike helmet that flashes red, along with the usual ones on the bike. I also put on my bright yellow reflective safety vest that I picked up at the local WalMart. I want to make sure drivers can see me at dusk and later. Here is a picture of our group right before we set out for the ride. My daughter leads this route and the only challenging thing is crossing one road near the fire station in Milford. Took us about 5 minutes to get a break in traffic to get across. There is a wonderful path in front of the shopping center along the highway, and around the corner…then it just “ends”. No crosswalks etc. And no real way to cross at the traffic light. So we try to cross just down the road at the next corner, but it is tough, because there is so much traffic from the highway, and so much traffic coming out of town toward the highway. 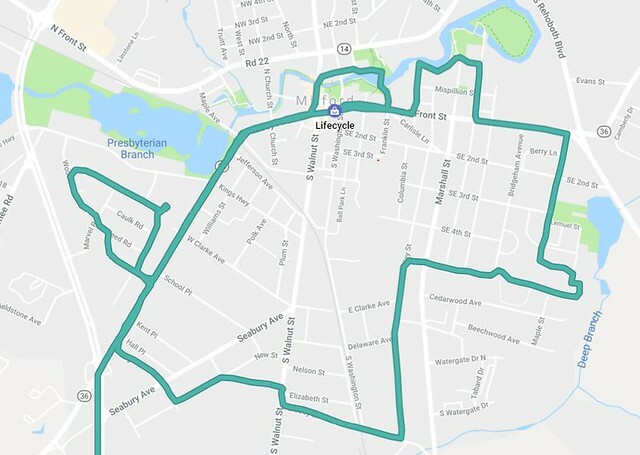 Overall, Milford is a very bike friendly town. For the most part, drivers in Milford are very respectful of the Delaware bike laws, which gives bikes “the lane”. Delaware Bike Code is also very “bike friendly”, yet a lot of motorists are not aware of the latest changes. A prominent citizen was hit and killed last year on a bike and the driver went to trial recently. The driver is awaiting sentencing later in the month. Basically, the law requires that vehicles can pass a bike in a lane only when it is safe to do so, giving the bike at least 3 feet of space between the vehicle and the bike, or by going into the opposing lane. There are not many shoulders that are safe to ride on (unpaved), and attitudes about bikes are all over the spectrum. 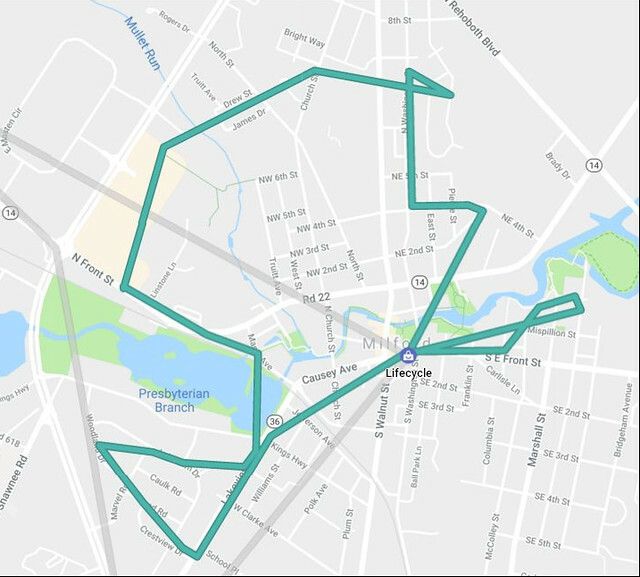 One reason I like riding in Milford is, for the most part, the streets in town are wide, all have 25 mph limits. Bikes are allowed to ride 2 wide in the lane, and operate just like a motor vehicle. The more I ride in group events the more I see drivers who are aware of the laws. I observe the other riders giving friendly waves to motorists and see the friendly waves coming back. So, being seen is good, being acknowledged by a motorist is better with a wave. Did you know, in Delaware, it is illegal to HONK at bike riders to facilitate them to get OUT of the motorist way. We did have a friendly tractor trailer driver give our big group a nice air horn “toot” when he was traveling in the opposite direction the other night. He was waving out the window too. That type of honk was friendly & fun, not scary! After riding, I did need to ice the hand a bit. Keeping it in one position on the grips was challenging, so I did try to adjust periodically. I am trying to follow orders, so I am keeping the ice on periodically through the day to prevent/reduce swelling. 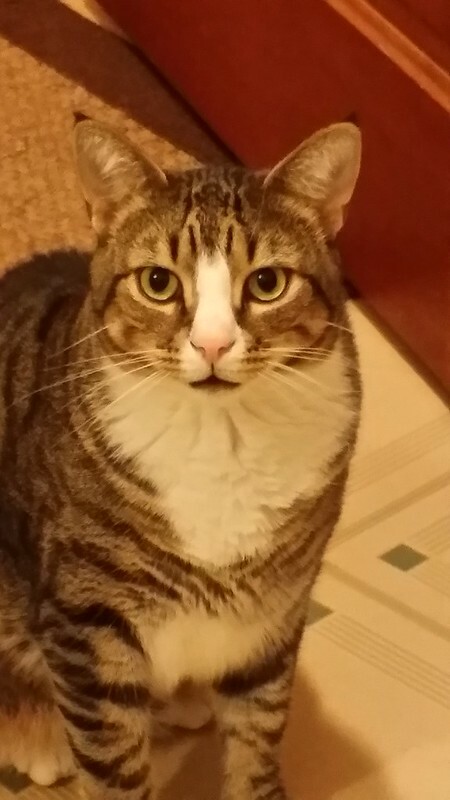 This makes it tough to do any real sewing or spending long periods in the sewing room. I did make some pot holders on Sunday. My husband has been my assistant, taking things in and out of the oven and was complaining about our old thinning pot holders. My friend Nancy tossed a scrap bit my way Saturday that was perfect for pot holders, and using my Fiskars 60mm stick style rotary cutter and a fresh blade, I was able to cut the pieces and some batting and Insul Bright thermal batting to size. Sewing was easier than I thought, and since these were 8×10 pieces, they were easy to quilt. I quilting some warm and natural to each piece of fabric, then sandwiched the Insul-bright in the middle, and added just enough quilting to hold the layers together and keep the Insul Bright from shifting. I had a terrible time binding them, as my fingers were just not “nimble enough” yet. They are about 7.5×9.5 finished, and they work, but every time I look at that binding I cringe. Not my best work, but I do have an excuse and they function. I certainly won’t take the binding off to fix them at this point. He likes the Insul Bright layer, but said they were rather “stiff” . I think washing will help to soften them up. 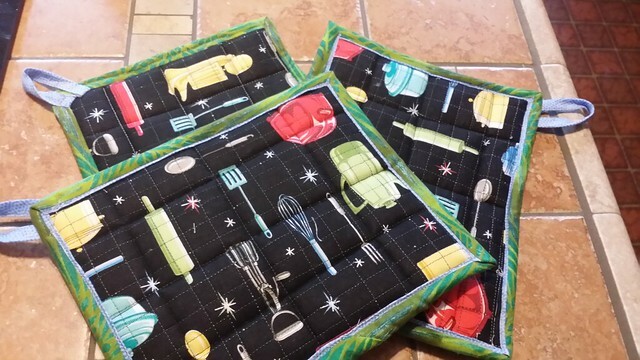 There was “just enough” of this cute fabric to get 3 pot holders. 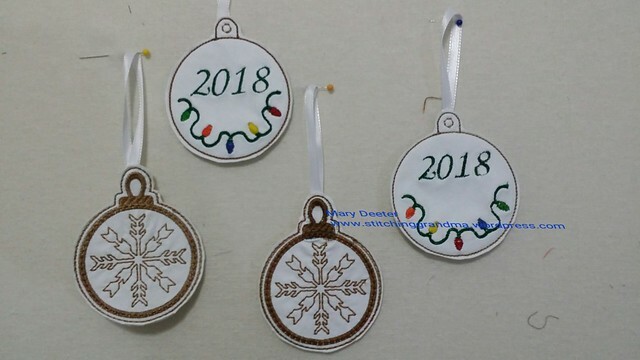 My embroidery club had the monthly gathering on Tuesday, and I stitched out some free standing lace (FSL) ornaments. 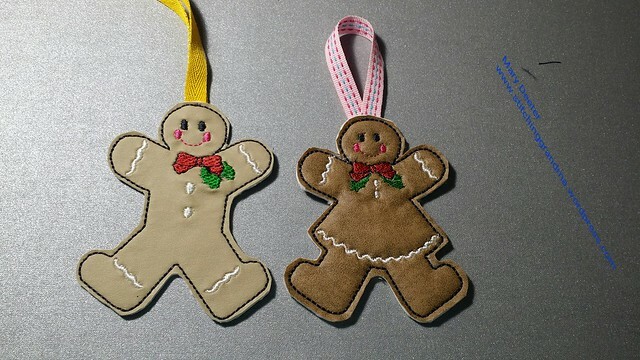 I got a little worried when the 2nd one was stitching, thinking I might just “run out” of the gold thread! I still need to put the item back in the hoop and get one or two more stitched. I learned from one of the members to cut a “larger piece” so I could get more than one in the hoop. This saves on the stabilizing products. The next ones I stitch out will require a different spool of thread I think!! 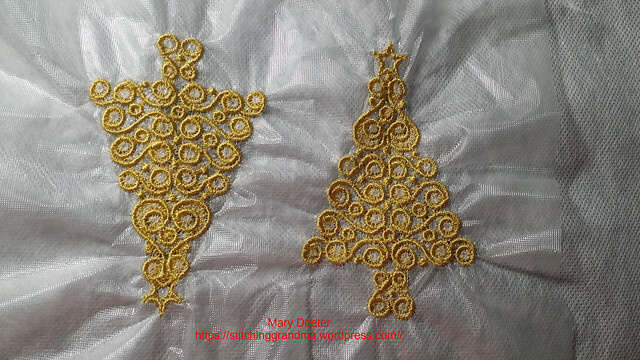 I had a couple of Free Standing lace (FSL) “FAILS” on Monday when I stitched up a couple of designs. I don’t know if it was bad digitizing or poor efforts on my part, but the designs fell apart when the vilene was washed out. I was so disgusted, as one design was more than 20,000 stitches. That was a lot of wasted thread! I got so mad I deleted all the designs in that group from my computer ! They looked perfect until you washed away the vilene! Keep your fingers crossed on these designs. I have 3 friends doing LOTS of FSL to decorate a Christmas tree for a charity event, and I thought I would give it a try. I am going to survey them to get info on the designs they had success with to order and add to my collection. 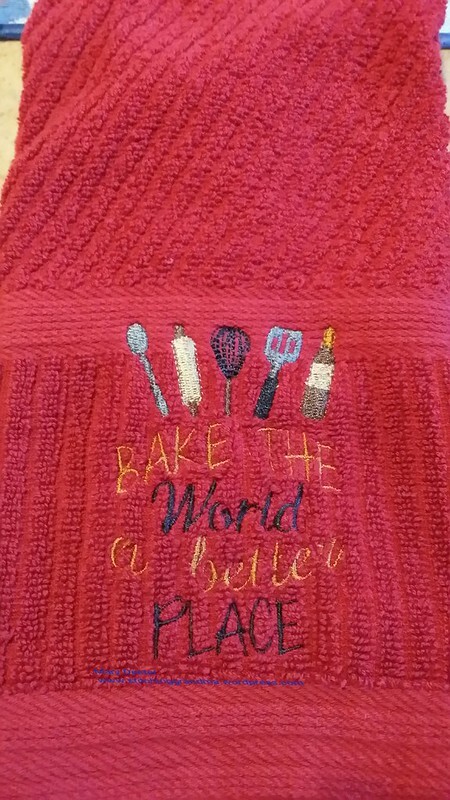 I got a little “design crazy” with embroidery downloads this week, and have some plans for gifts. I found myself overloaded with the “color charts” that I print when I download a design. I added 3 new “notebooks” to my filing system, and spent an afternoon “filing” designs in them. I broke out a couple of categories into their “own” notebook. I belong to several Facebook groups that send you in search of free designs, so I didn’t spend much on the designs, other than ink and paper. I read comments/questions from people in groups about how to organize your embroidery design downloads. I feel like I have a good system. I have a folder on the computer for all my embroidery design downloads. Inside that folder are many subfolders, by category. I have 53 MAIN categories, the rest of the folders are “sub” folders. 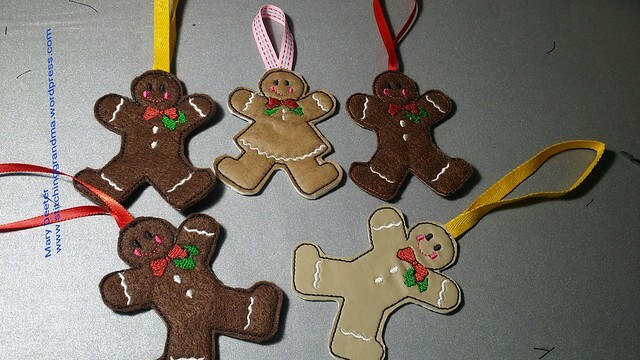 My categories are things like Animals, alphabet, verses, sewing designs, Christian, transportation, holidays, seasons etc. Inside a category, like SEASONS, I have sub folders, WINTER, SPRING, SUMMER, FALL. Inside each of those sub folders are many ZIP folders with the designs. I have 1.5 g b in files – 8007 files in 500 sub folders. That is a LOT to contend with if they were not organized. Usually when you download a design it comes in a ZIP folder, so that accounts for the number of sub-folders! When I print out the color change sheet, I try to file them in a notebook under a tab that mirrors what is on the computer. This helps me “find” the actual design on the computer when I want to use it. I also try to “add” detail to the automatically assigned file name when I download, using what is printed on the color change sheet so I can make sense of it later when I want to stitch out the design. All in all, this seems to work for me. Most of the designs I have were freebies. I’ve posted previously about my “sources”. I very rarely buy a design. Hubby saw one the other day while I was working on the computer that he wanted for a gift project, so I did break my “no buying” rule. I am curious how others organize their designs. I have a friend who just keeps them in the “download” folder on the computer, but has challenges finding what she wants. I hope you have been taking the opportunity to follow along with Carole’s Autumn Jubilee posts. Her post yesterday included an Autumn Jubilee Placemats Sew Along. 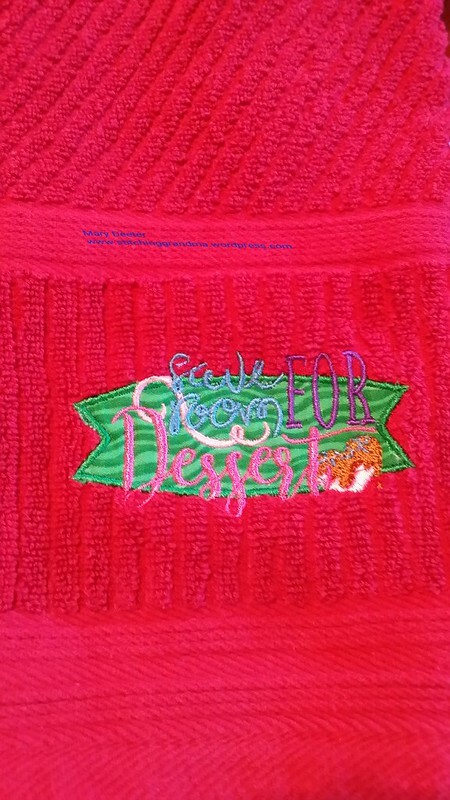 Be sure to follow her blog and sew along for a chance to win great prizes. Are you “sewing along”? I am following along this season due to my limitations, but enjoying all her posts! Hi all….I am back home after a visit to the great state of Texas! I had a great time with family, and even did a little “rotary cutting 101 training” . We did a little “re-engineering” of some fabric, and made 12 dinner napkins out of a thrift store table cloth. It’s been a busy week since I returned. On Tuesday, my “new bee”, the Queen Bees gathered for a few hours of sewing and info sharing. 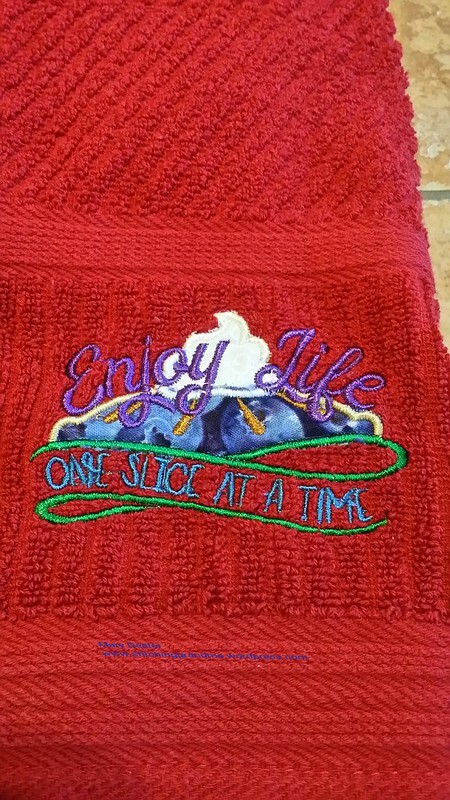 We have a future project that I did a little “test stitching” on today. 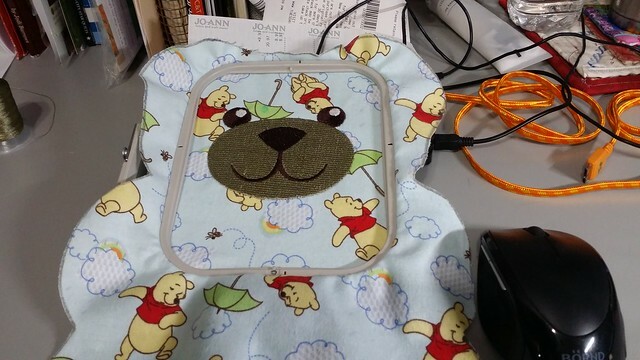 This little Bear face came from Embroidery Library.com, design # M3994. The “plan” for the future bee project will be bear faces on flannel (without the muzzle), and I needed to see how it went hooping, placement etc. I think I will assemble this bear for a new grandbaby of a church member! 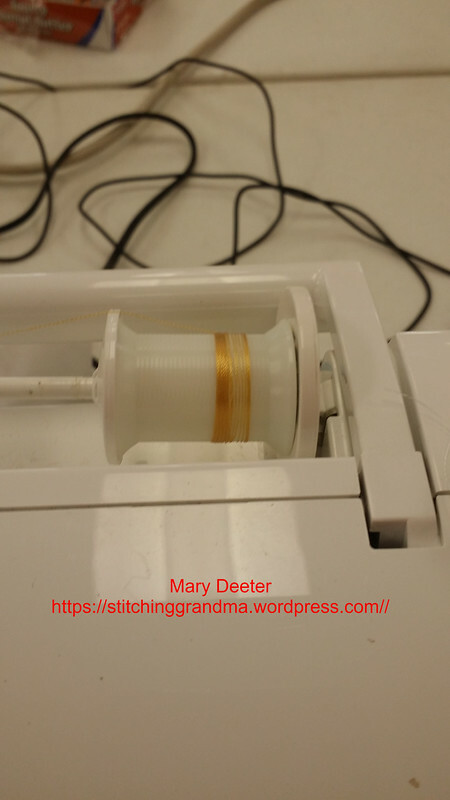 Several of the ladies in the Queen Bees have Brother embroidery machines. Today, I learned that there is a need for learning how to move files between the computer and the embroidery machine. I wrote a tutorial, with photos, to help guide in moving downloaded embroidery file designs from the computer to the embroidery machine. If this is of interest to you, then “read on”. Just as a heads up; this guide is specific to Brother embroidery machines. I’ve put together a little guide and it is available on my google drive! Let me know if this link works for you and you find the info helpful.